Plus we're going to go over some of the other questions you might have about your graduation pinning ceremony from nursing school. First of all, congrats are in order. 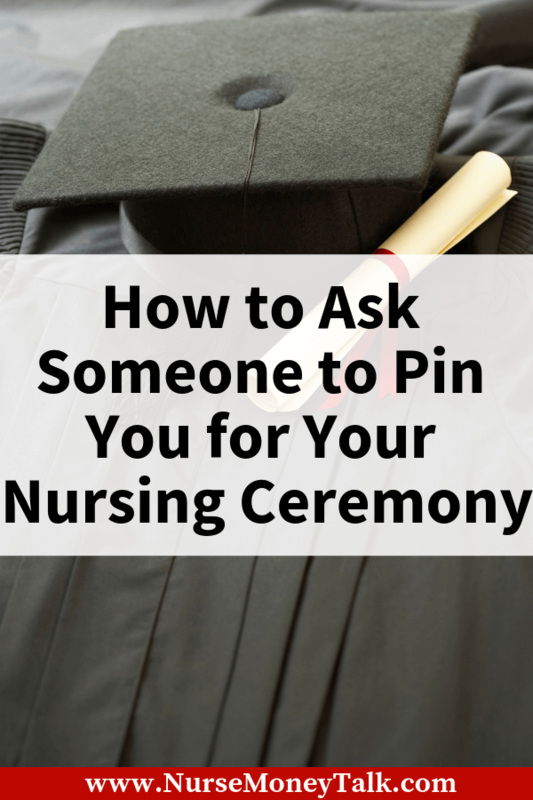 If you’re searching trying to figure out how to ask someone to pin you for your nursing school pinning ceremony, you're probably about to graduate. Or at least you’re pretty darn close to it. A nursing pinning ceremony is just a way nursing schools and nursing faculty use to honor and acknowledge nursing students who are done with nursing school. Or at least know they’re going to graduate. It’s a way to celebrate the achievement of nursing students who are one step closer to becoming full-fledged nurses. I remembered my nursing ceremony like it was yesterday. I never really cared much for ceremonies like graduations, but this was different. There’s something truly special about the pinning ceremony. Why have a nursing graduation pinning ceremony? The nursing pinning ceremony is similar to a graduation ceremony. But in my humble opinion better. For starters, the pinning ceremony is just for nurses. The history of the nursing pinning ceremony dates back all the way to the 12th century. At that time some monks aided in helping ailing crusaders. When new monks were sworn in, they vowed to help soldiers who were ailing in a ceremony. In that ceremony, the monks were given a maltese cross. According to HCPRO, those were one of the first badges given to nurses. Nightingale According to Walden received a cross for all her efforts during the war. She, in turn, passed it down to her brightest pupils. As more hospitals recognized the value of nurses, they began creating pinning programs in the 1880s. By 1916 the pinning ceremonies were common throughout the United States. As you can see, you’re part of a long tradition that dates back centuries. If you’ve been to a graduation a lot of it is going to be fairly similar. You're looking at probably weeks or months of anxiety leading up til the event. Your school is going to rent out a venue or have it somewhere on campus. Your pinning ceremony is probably only going to have nursing students. There are hardly any schools if any that I’m aware of that still have their nursing graduates dress in old school nursing graduate attire. Most that I’m aware of will have you buy a cap and gown. I have heard of some that don’t do cap and gowns but will encourage you to wear professional attire. Since nurse pinning ceremonies are only for nurses, they don’t tend to last anywhere near as long as traditional graduation. Most students usually want to invite friends and family members to come celebrate with them. You’ll have opportunities to either buy invitations from your school (probably through a third-party they promote). Or you can get one on your own. Typically getting your invitations for your nurse pinning ceremony outside of your school will be cheaper. Not to mention it will give you better options in terms of selections and customizations. You may or may not have a trial run. They do this to make sure that everybody is on the same page about what’s going to happen the day of the pinning ceremony. Like I mentioned earlier the whole event will be very similar to a typical graduation. Once everyone is seated your graduating class will proceed in and sit in their assigned seating. At this point, your program will proceed. Depending on your school your program could vary a lot. Most of what I’m writing is based on my personal experience and the experiences of other people I’ve talked to over the years. The dean of your nursing college is going to talk. You’ll probably have one or two students talk also. These students could be either the valedictorians or it could be based on something else. If I remember correctly, I believe it was the president of our Student Nurses Association that gave a speech. You’re probably also going to have an outside speaker who will either be really good or really bad. From personal experience, and I’ve been to my fair share of graduation type ceremonies. I feel like the speakers they bring in are either really good or really bad. I hardly if ever see one that was just so so. Somewhere towards the end of the ceremony the part you actually care about will happen. When I went through my pinning ceremony, it was the dean of the college of nursing that pinned the pins on every student. I have heard of other schools where the students are allowed to ask someone to pin them for their nursing ceremony. After the pinning it won’t be too much longer and than you and your classmates will proceed out. Looking back on my pinning ceremony I took it for granted. I think it was because at that point I was just ready to be done with nursing school. If that’s how you feel, I don’t blame you. What I would encourage you is to try at least to enjoy the moment. It is your ceremony. It's a celebration of all your hard work. And all your accomplishments. If not for you then do remember that other people would like to celebrate with you. It could be friends, family members or your spouse. Those are people who were either emotionally, or financially invested in seeing you through this day. Even if you don’t want to be there. Don’t ruin it for them. I want to tell you that this day is all about you. It’s not just about you. It’s celebrating you. But it’s also about them. If your school gives you an option to pick someone to pin you, you might be struggling. You might not know who to ask. Here are some suggestions. Your spouse is a great first option for those who have it. Honestly, this is probably your default option. Who better to ask than the one who’s been there with you from the start. Your spouse hopefully has been supportive both emotionally and financially. There’s not too much of downside for using this option. Picking your parents to place the pin is the second best option. Similar to your spouse your parents have been with you from start to finish. Encouraging you every step of the way. If they’ve invested in you not just emotionally but financially than this would be a great way to pay them back. Why parents might not work. If your parents have not been supportive than this would probably be a no-go. Also if your school only wants one person on stage, it might be an awkward decision deciding if mom or dad is going to do the honors. You might find that your big brother or big sister was your biggest cheerleader. If that’s the case, you might want him or her on stage with you. Why picking your sibling might not be a great idea. If you have more than one sibling which one are you going to pick? Even if everybody (including the sibling you wouldn’t choose) knows the obvious choice, it doesn’t make it any easier. People’s feelings get hurt. Not to mention guilt-tripping would be at an all-time high. Sometimes the biggest supporters we have isn’t family but our friends. If you have a friend that’s closer than your family that person would be a good choice. Why picking your friend might be difficult. You’re going to run into the same issue as picking your sibling. Which friend are you going to choose? Who’s feelings are going to be hurt? Do you have a nursing faculty member that’s made a significant impact on you? If you do, then you might think about picking him or her to pin you during the nursing ceremony. Why picking one of your nursing faculty to pin you during the nursing ceremony might not work. There are a couple of reasons why this might not be a good idea. First one of your family members might give you a hard time for picking a nursing faculty over one of them. Secondly, the nursing faculty might turn you down because they might have other roles they have to do during the pinning ceremony. Third, your faculty member might feel uncomfortable pinning you for fear of it looking like he or she is taking favorites. When you’re asking someone to pin you for your nursing ceremony, it’s relatively straightforward. But you really don’t have to do anything big. We even came up with this simple format you can use. If they agree to do it, make sure to thank them after the pinning ceremony for taking the time to support you. Thank them anyway for thinking about it. Then ask the next person on your list. Your next steps after graduating from nursing school is a big deal. We also know it can be very nerve-racking. That’s why we came up with several articles you can use as resources to answer some of your most asked questions. Are you ready for your nursing graduation pinning ceremony?